This is the documentation I prepared to support our Chromebook and Google Apps for Education implementation. It provides a comprehensive overview for all of our stakeholders, and includes the rationale, pedagogical, cost and technical considerations for this project. Link to the Google Doc version. In the latter part of 2013, I began to meet with teachers from my school board to begin their professional learning cycle on 21st Century Learning & Teaching. The shift from teaching to learning is intentional as the focus of this Professional Learning Cycle (PLC) is on their own learning and professional development. The PLC will follow a collaborative inquiry model, where there will be a lot of flexibility and time for them to explore their own professional growth and development and learn from each other. As Dr. Ann Lieberman (Stanford University) has stated, teachers learn most from other teachers - they are real and have practical experiences that they can trust and can relate to. It is through this exploration that the teachers will discover different ways for their students to become successful in achieving the outcomes they have defined. Each participant will choose a numeracy or literacy focus in line with their school improvement plan in order to achieve the Board system goals in student achievement. Over the course of the cycle, teachers will receive a Chromebook and use the tools of the Google Apps for Education suite to facilitate their own learning as they design activities and projects for their students (our rationale for choosing Chromebooks & GAFE). Through the professional learning opportunities provided by this collaborative inquiry, teachers will better understand the changes in instruction that are required and the 21st Century tools that can be used in order to attain higher levels of achievement in students’ literacy and numeracy skills. The added benefit is that they will be able to model 21st century learning for their students so that it becomes a natural part of what happens inside and outside of the classroom. Adequate time to reflect on these changes and to become familiar with these tools is essential for a successful system-wide implementation. There are all sorts of examples where technology is deployed district-wide without the proper training for teachers or the lead-time to consider the most effective use of these tools. Our goal is to transform learning and teaching in our Board - not to merely map existing teaching practices on to new technology. My role is to facilitate this exploration and to try to model the strategies and tools that they can use with their students. I am leading this PLC as part of my Teacher Learning and Leadership Program project funded by the Ministry of Education. We begin with an examination of the key student outcomes identified in our 21st Century Learning & Teaching Blueprint. These outcomes; effective communicator, reflective, creative & holistic thinker, self-directed, responsible life-long learner, and collaborative contributor, are not new. They have been embedded in our Ontario Catholic School Graduate Expectations for many years. While they are not new outcomes, there are many new strategies and tools we can choose to achieve them. I also encourage our teachers to consider the importance of modelling these outcomes for their students and the process for attaining them, in order to promote a 'culture of learning'. I spend some time reviewing the approaches that are critical to fully leverage 21st century learning and teaching. Otherwise, we are unlikely to see the kind of transformation in educational practice that we are seeking. 1) When we encounter a problem of practice, it is an opportunity for us to re-imagine our teaching. We adopt a 'greenfield approach' where we are not constrained by the previous instructional methods we have employed. When I started teaching French, I taught my students the same way I learned the language in school, by teaching grammar rules and conjugating verbs. This is not a natural way to learn a language and therefore I had very limited success with my students. I started to experiment with new methods and was fortunate enough to observe another teacher that used a revolutionary program with a formalized sign language known as Accelerated Integrative Method (AIM) that helps students to acquire, comprehend and speak new languages with a high degree of fluency and accuracy. I noticed dramatic results with my students as a result of implementing this new program. New possibilities for learning equals new opportunities for teaching. 2) Sometimes we let our fear of making mistakes prevent us from learning new things - as educators we need to step outside of our comfort zone and try new things and new methods. As part of this PLC, teachers have the license and are encouraged to experiment with the Chromebook and the GAFE tools, because when we are in 'beta' we continue to learn and grow. An iterative approach is ingrained in the professional learning cycle - we will all learn from each other and use our experiences (good and bad) to inform our practice. I show teachers the video below because it illustrates how ''re-framing failure as iteration allows students and teachers to thrive''. I also show the 20% project as an example of what this looks like at the secondary level. 3) As we look to embrace technology and all of the wonderful forms of expression and collaboration that it affords we should be moving from substitution (where technology is a tool that involves no functional change) to modification and re-definition (where technology allows for the significant redesign of tasks that were previously inconceivable. 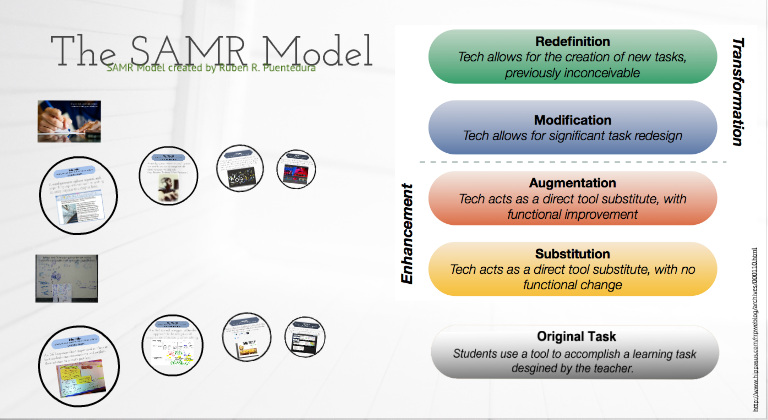 The image below is from the excellent presentation by Jim Cash on ''Technology in the service of learning'' and the SAMR model. I also refer our teachers to the SAMR Ladder created by Susan Oxnevad and the Arizona Technology Integration Matrix so they can see practical examples of the different ranges of technology integration and characteristics of student engagement. I use the Arizona TIM because their videos are viewable on the Chromebooks (unlike the FCIT ones created in Quicktime). 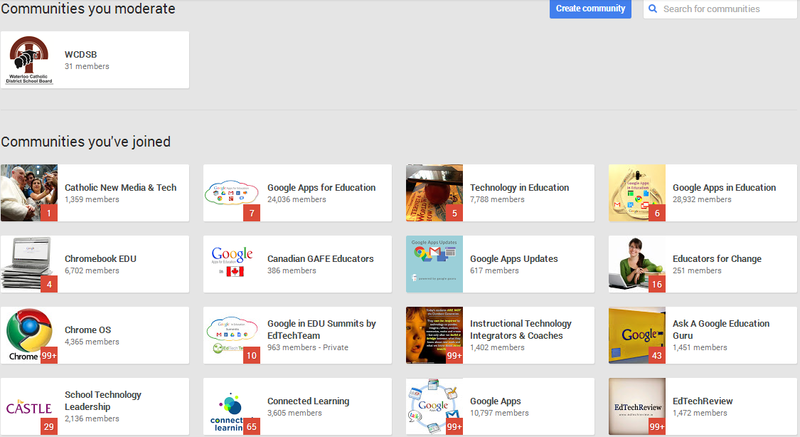 4) As participants in the PLC they will be invited to become members in variety of communities and Professional or Personal Learning Networks to share best practices and resources in order to grow their knowledge and understanding of these tools by connecting with educators from around the world (Chromebook EDU, Google Apps for Education, Educators on Google +). This is a critical strategy to build capacity within our Board so that the Chromebook and GAFE project is a successful and sustainable implementation. We have also created our own Waterloo Catholic DSB community to facilitate sharing and collaboration across our Board. 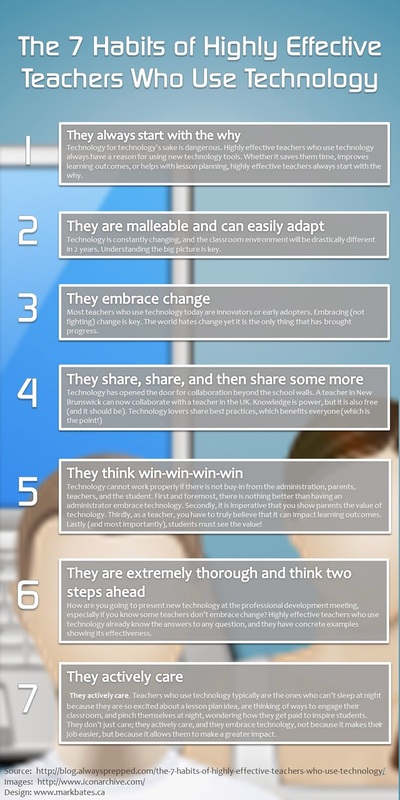 The infographic below on the The 7 Habits of Highly Effective Teachers Who Use Technology from the edtech blog Always Prepped provides a nice summary of the qualities we are looking to embrace. Future blog posts will focus on the specific activities, tools and strategies that will be used to facilitate this professional learning cycle. I will also outline the methodology that will be used to measure the success of this professional development program.